sustaining the general population with misleading statement about crafted by the tripartite Committee on the new National the lowest pay permitted by law and misdirecting the administration into choking workers and constraining them to end up slaves as opposed to workers. Rising from its National Executive Council meeting in Abuja, the NLC said workers in the country will not be intimidated by any threat of no work no pay. Labour pointed out that the government was trying to return the country to the dark days of the Abacha military regime and force workers not to protest against inhuman treatment by the government through non payment of salaries. The Congress accused the Minister of Labour and Employment, Dr Chris Ngige of trying to twist the truth by misinforming the public that the meeting of October 4 and 5, 2018 was inconclusive as the members of the Tripartite Committee on National Minimum Wage did not agree on a figure. 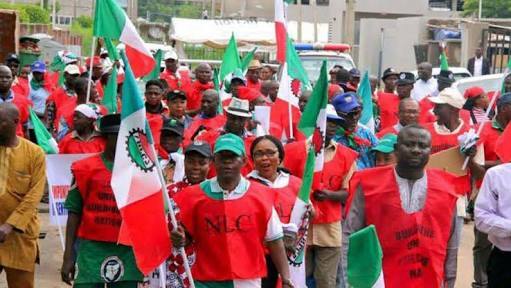 They NEC which is the highest decision making organ of the NLC said the recent antics of Minister of Labour and Employment was anti-labour and anti-workers especially with regards to the Minister’s utterances which the it deemed as an act of bad faith intended to scuttle the work of the Committee on the new national minimum wage. It rejected and condemned the Minister’s claims in the media that negotiations are still ongoing on the issue of a New National Minimum Wage which implementation is already long overdue, adding that it was disturbed by government’s new offensive against Organized Labour and workers’ rights as contained in a report submitted to the Federal Executive Council by the Minister of Labour and Employment and on which Government has issued a White Paper. The communique signed by the NLC President, Comrade Ayuba Wabba and General Secretary, Dr. Peter Ozo-Eson argued that fixing of tenure for workers holding union executive positions in contravention of the provisions of ILO Convention 87; and while the prohibition or exclusion of non-card carrying members of trade unions from leading or being part of negotiation delegations of trade unions reminiscent of the Abacha military era. ‘To hold joint organ meetings of the Central Working Committees (CWCs) of all the Labour Centres on November 2, 2018 for final preparations for a full engagement with Government on the national minimum wage and to commence an indefinite national strike and industrial actions from November 6, 2018; except government accepts and commences the process of perfecting the payment of N30,000 as the negotiated and compromise new national minimum wage before that date." The Congress maintained that “the threat of no work… no pay will not deter it from embarking on strike when necessary as it has always complied with legal requirements precedent and will always comply with those requirements. The NEC-in-session urges Nigerian workers to disregard government’s directive on “no work, no pay” because workers are already being impoverished and being owed arrears of salaries.